The “lam” in Arabic is the letter “L.” The Honorable Elijah Muhammad said that he recognized it because that letter seemed to have been all through the book and that it stood out all through the writing. When he told me that I listened very attentively to him as I always did, especially when he seemed to be really concerned about what he was talking about, or engrossed, so to speak, in what he was talking about. As I listened to him very closely, I was trying to interpret the vision that he was telling me about. There were others at the table that day when he talked about his vision. I said to myself, “What can this ‘lam’ stand for? What can it represent?” I knew that there was no other book coming to Muslims after the Holy Quran, but the Holy Quran. So, I knew that it could not mean that a physical book was coming after the Holy Quran to replace the Holy Quran. Although he had said things to that effect, I understood him. I knew that he did not actually mean what we thought he was saying — he meant something else. He meant that a great understanding, a new way of looking at the book, was coming. So, in our life, it would be like a new book coming in. Then, it came to me. I said, “My father is telling us that the new book that is to come is really a new book to us because we have never known the Holy Quran.” We have known the Bible. Most of us know much more about the Bible than we know about the Holy Quran. In fact, for most of the years of the Honorable Elijah Muhammad’s leadership, he did not allow the Holy Quran to be preached or to be handed out freely among the believers, but he always held it up high as “the book.” He said that the Holy Quran was the pure book, but he never encouraged us to really get into it. I knew that his vision of a new book was a vision of the Holy Quran, but it was vague in my mind. The idea, or the thing that I was seeing, had not taken complete form, so I put it aside. While I was trying to think of a new drawing for the mosque blackboard, the picture came to form. I said that the vision should not be a drawing for the blackboard, but it should be the new flag for the Lost – Found Nation of Islam. The new flag is really a book, and the book is the Holy Quran. On the book is written “La ilaha ill – Allah,” which means, “There is nothing worthy of worship as a god but Allah” and “Muhammad – un Rasulu-llah which means that Muhammad is the Messenger of Allah. If you have some knowledge of the contents of the Holy Quran, you know that this first principle (kalimah) or pillar of faith, is all through the Holy Quran from cover to cover. It dominates the whole Holy Quran. If you count the number of times that the letter “lam” is repeated in that kalimah, you will see that it stands out more than any other letter in the kalimah. When you look at it, you see “lam” before you see anything else. So, this was his vision. 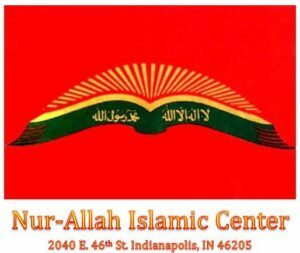 I think that the Honorable Master Elijah Muhammad (peace be on him) should get the credit for this vision, and I think that it is a flag that you all can identify with and be proud of. A new world needs a new flag. The Muslim world has come to be identified with the symbol of the crescent and the star, but when you read the Holy Quran you do not find any crescent and star in there. Islam is a simple religion; that is, it is not a religion that is covered up with symbolism or ritualism. It is a religion that comes straight forward and straight out in the open with what it is all about. What brought on the Islamic flags with the emblem of the star and the crescent was the Christian crusades that came against Islam. The leaders of the Christian army carried the cross, so the Muslims, reacting to that, raised the crescent. The crescent was a better symbol because the cross represents death. So, here was an army representing a nation or society of people that held sacred an emblem of death, and they could not see the ugliness of what they were doing. All they knew was that it was Jesus that they identified with. When you really think about it, the lifting of the cross as something sacred really is a disgrace to the beautiful world that Jesus brought into existence. The emblem itself brings to mind death and misery — it does not bring to mind life. You have to interpret “Jesus” to arrive at life as a meaning for the cross. You have to connect Jesus, his purpose, his sacrifice, and his teaching with the emblem-but how many of us will see the cross and do all of that interpreting? When we see it, we see something that is on graveyards. We think of the suffering and the misery that Jesus had to bear. To us, it is an emblem of death and shame and suffering. So, the star and the crescent is a better emblem to us than the cross. What the Muslims were saying to the Christians is this: “You lift up death and you see death as glory, but God has pointed out in His scripture that His glory is readily seen — not in the grave, but in the heavens.” Read the Bible from Genesis to Revelation. God never points to the graveyard to show us His glory. He says that we should look at the heavens and how they are lifted up in glory—the sun, the moon, and the stars. Muslims were saying to the Christians that the sign of God’s glory is not death, but life, and that the sun is the source of life in this physical world and the moon is a necessity. The stars are very useful to man because they direct his path at sea and through the land. So, the Muslims raised a much better sign, but they did not raise the sign upon orders from Prophet Muhammad (peace and blessings of Allah be upon him). They raised it as an answer to the cross that was raised in war against them. What should -we really exalt? What should we really raise? It is knowledge! We know that emblems cannot save humanity and pictures and signs cannot save humanity. Men can look at the stars and the moon in the sky all their life, for generation after generation, until the land grows old and dead. That does not mean that they are going to be lifted up as a society. The savage, primitive man and woman see the sun, moon, and stars but what has made the difference? Knowledge. The book of knowledge for the Muslims is the Holy Quran. If we exalt anything other than knowledge, we exalt the wrong thing. You may ask, “What about God?” God is not something that we know in any sense other than in a body of knowledge. We do not know God in flesh and we do not know God in symbols. We know God in knowledge. You may say, “I feel God in my flesh and that is how I know God.” That is only the beginning of knowledge. Feelings are the beginning of knowledge, but you cannot say that you “know” until you grow up a little bit taller than feelings.